The Calder Trophy race appears to be down to four players. The 2018-19 NHL season has featured another great rookie class, with multiple first-year players making an immediate impact on their respective teams. While last year’s group of New York Islanders forward Mathew Barzal, Arizona Coyotes forward Clayton Keller and Vancouver Canucks forward Brock Boeser was offense-heavy, this year’s class – outside top rookie Elias Pettersson – has seen defensive-minded position players shining, including two defensemen and a goalie. Here are the four leading candidates for the Calder Memorial Trophy for rookie of the year. 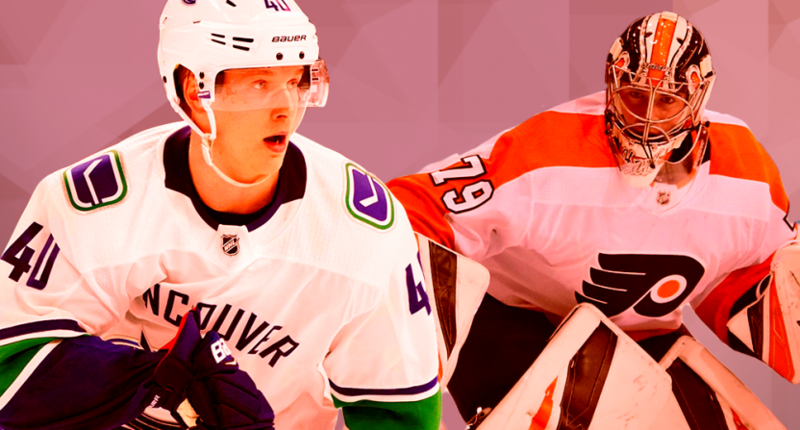 In this year’s rookie class, Pettersson is in a league of his own. Taken fifth overall in the 2017 NHL Entry Draft, Pettersson’s had little to no problem transitioning from Sweden as a 20-year-old. The Swede’s made an immediate impact in his rookie season, scoring five goals in his first five games and hasn’t slowed down as the season progressed. Gifted with nasty hands, Pettersson is a human highlight reel. He’s got an uber-quick release and incredible vision, despite a skinny 6’2″ frame. He routinely makes goalies look silly and has paired up with Boeser to give the Canucks a heck of a future. Defenders never know what to do with Pettersson possessing the puck because he’s such a creative, dynamic player. On the season, Pettersson is above a point-per-game pace leading the rookie scoring race with 24 goals, 23 assists and 47 points in just 43 games. If he didn’t miss a few games earlier in the year after being on the receiving end of a dirty hit from Florida defender Michael Matheson, he’d be near the league’s top scorers – an absurd notion considering he’s still a rookie. Pettersson is one of the most fun players to watch. He’s got the Calder Trophy in the bag, barring a season-ending injury. He’s got 100-point potential and will challenge for future scoring titles. It’s scary to think what he’ll be capable of in his prime. The Philadelphia Flyers’ season was a full-blown disaster before Hart arrived. GM Ron Hextall and coach Dave Hakstol were given walking papers after Philly lost 19 of their first 31 games. Between the pipes, things weren’t much better, as seven different goalies including Hart played in at least one game, tying an NHL record. Hart, a second-round pick in the 2016 NHL Draft, has surprisingly stabilized the team’s goaltending woes, arriving much earlier than expected. In 16 starts, Hart has posted 10 wins, five losses, and one overtime loss, along with a 2.48 goals against average and a .925 save percentage. Facing more than 31 shots a night, Hart has pushed the Flyers back into playoff contention with seven straight wins during the team’s eight-game winning streak. Considering how long goalies usually take to make an impact, Hart’s stellar performance between the pipes is extremely impressive. He was playing major junior hockey with the Everett Silvertips just last season. Among rookie goalies, Hart’s the best. The future is now for him and the Flyers, who desperately needed some help. Hart’s delivered. Dahlin entered his first season with Buffalo with plenty of hype, considering that he was the first overall pick in the 2018 NHL Entry draft. Through 52 games during the Sabres’ up-and-down season, he’s remained productive and as advertised. Dahlin has shown off plenty of the skills that made him the top pick: He’s a phenomenal skater, has great size at 6’3″, and features an above average two-way game. Dahlin can log big minutes and defend opposing team’s best players while simultaneously taking on a top offensive role on the top pair in all situations. You’d never know Dahlin is still only 18 years old. On the season, he’s posted a 52.5 shot differential at even strength, while adding six goals, 23 assists, and a rookie defenseman-leading 29 points in 52 games. Buffalo’s playoff destiny might be unclear, but Dahlin’s future as a number one defenseman isn’t. The Sabres lacked a top-pair d-man for years and with Dahlin, they’ve finally landed one for the foreseeable future. The Dallas Stars haven’t been shy about giving Heiskanen big minutes, as the 19-year-old Fin has averaged 23 minutes of ice time per game. In a largely-shaky season in Dallas, Heiskanen has been a steady force from the blueline during his rookie campaign. In 53 games, the third overall pick in the 2017 NHL Draft has nine goals, 14 assists, and 23 points. He’s played in all situations and given the Stars’ defense a huge boost. Heiskanen has a great first step paired with elite skating ability. In a quarterback role, he can quickly get the puck up the ice and be counted on to make smart plays. Like Dahlin, you’d never know Heiskanen was a rookie if you didn’t know before watching him. He’s incredibly mature for a teenager. Considering his heavy workload this season, he’ll be a really special player when he reaches his prime and becomes more confident.